Later this morning, Io's trailing hemisphere will experience a total solar eclipse when Ganymede passes between Io and the Sun. The eclipse runs roughly from 13:34 to 13:39 UTC (14:08-14:14 UTC as seen from Earth). The video below was created in Celestia and shows the eclipse both from above Io, showing the shadow of Ganymede cross Io's surface, and from the surface of Io, showing Ganymede pass in front of the Sun. 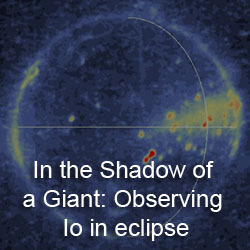 Computer Animation of the total eclipse of the Sun by Jupiter's moon Ganymede over the trailing hemisphere of Io on July 22, 2009. 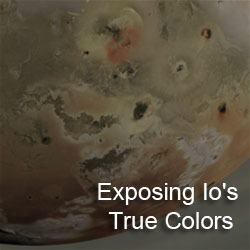 First half shows a view from 4500 miles above Io's trailing hemisphere. Second half zooms in on the sun from an unnamed volcanic pit showing the total eclipse. 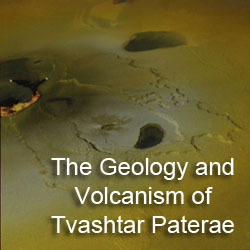 The animation runs from 13:30 to 13:40 UTC on July 22, 2009. EDIT 07/22/2009 10:06 AM: Fixed the title of the article, changing Jupiter to Ganymede. Obviously, a Jupiter eclipse is nothing special. A Ganymede one is.